Miranda IM 0.10.80 / NG 0.95.9 Portable » SoftLab-Portable.com - Portable Soft! Management and organization of hundreds of IM buddies on many IM networks. Simple recall or deletion with the DB Tool or History Sweeper plugin. Contact details or photos visible with mouseover. (Needs additional plugin). Compact and portable: with few plugins. Security/Privacy: Saves history on hard disk. In May 2012 Miranda IM was forked to Miranda NG (New Generation). The reasons were a shift in the development team and the slow-paced development of the original Miranda. The main differences between the original client and the fork are: a switch to Visual Studio 2010's compiler thus dropping support for Windows 95/98/ME and non-Unicode plugins, and the fact that the core and plugins development was combined and that they share a unified repository. 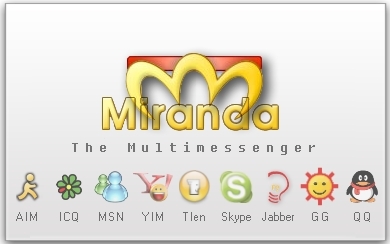 The protocol plugins included with Miranda IM are AIM, Gadu-Gadu, ICQ, IRC, Microsoft Messenger service (a.k.a. MSN, .NET, Live, etc. ), XMPP (& Google Talk), and Yahoo! Messenger. Other protocols available via plugins include Bonjour Fetion, Facebook Messenger, Inter-Asterisk eXchange, Lotus Sametime, NetSend, MySpace, Tencent QQ, SIP, Skype (requires Skype), Tlen.pl, Xfire.